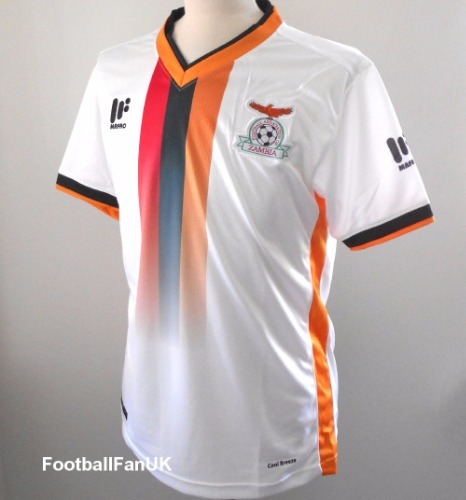 This is the official third shirt for the Zambia national football team (known as the Copper Bullets) for the 2017/18 season. Produced by Singapore sportswear company Mafro Sports, who also supply Kenya and Zimbabwe national team kits. We are an official Mafro Sports supplier. New in manufacturers packaging. - Woven Zambia FA federation badge. - White with red, black and orange vertical stripes and orange and black trim. - New with tags in manufacturers packaging. - Adult Medium size. Actual chest size 40", length 27". - Adult Large size. Actual chest size 42", length 28" (slim fit). - Adult XL size. Actual chest size 45", length 30" (slim fit).